If you’re like me, an idiot with ten grand to blow on a dream of dying in the stupidest way possible, then you owe it to yourself to check out Hammacher Schlemmer’s latest rich-dumbass gift: a $9,990 electric three-wheeled deathtrap that can go 75 mph! I guess I should be fair; I don’t know for sure that this fiberglass, 33 horsepower electric trike is a deathtrap, I’m only suggesting it is because the roll bar seems to be well below head level and the description says it “meets motorcycle safety standards,” which are generally one step above prisoner of war safety standards. And, to be fair, I drive almost exclusively cars that are technically deathtraps, and I love them. But this thing just isn’t really the same. 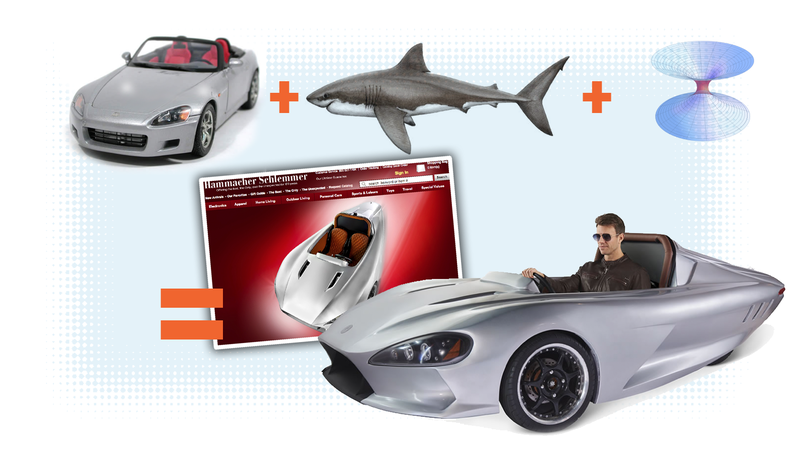 Also amazing about Hammsmacker Schmuckler’s cyborg sharkcar: according to the picture, you don’t need thumbs to drive it! I bet that’s from some Hammgrabber Schlummlord payment plan where they’ll knock $250 off the price in exchange for one of your thumbs, which are then ground up and made into special fill material for Hammlover Schleppelfinger’s Side Sleeper Bed Wedges. Still, this thing has a 100 mile range and is actually for sale, which is more than I can say for Elio.